Berkery Noyes Represents Ascend Media Holdings In Its Sale Of Event Media Division - Berkery, Noyes & Co., LLC. 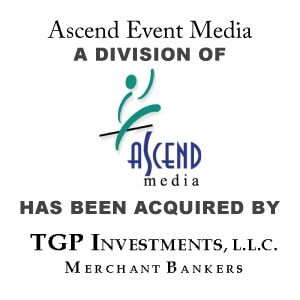 New York, Sept. 1, 2009 — Berkery Noyes announced today that the firm represented Ascend Media Holdings (“Ascend”) in the sale of its Event Media unit to TGP Investments, LLC. Terms of the transactions, were not disclosed. Ascend’s Event Media business unit is a value-added provider of publications and media to tradeshows, conferences and association/corporate events. As a well-respected publisher of event media products, Event Media has contributed to enhancing thousands of conferences and events over the last two decades. The Company’s services allow clients to increase attendance at their events, engage attendees in education and other programs, build membership and further promote the image and brand of their organization through the creation and distribution of custom event media products. These products include daily newspapers, program directories, exhibit guides, e-newsletters as well providing the most extensive suite of digital products in the industry. Event Media offers a portfolio that meets the needs of clients throughout the event lifecycle: pre-event marketing, publications during an event, and post-event follow-up materials. “This is an excellent outcome as TGP Investments, LLC is a local, Kansas City based private equity group with the right experience to help the company grow.” said Tom O’Connor, the Berkery Noyes Managing Director who managed the transaction on behalf of Ascend Media Holdings. “This is excellent outcome as TGP Investments, LLC can capitalize on the franchise and support Event Media’s growth” said Mark Brockelman, who is CFO of the parent company Ascend Media Holdings. Berkery Noyes acted as exclusive financial advisor to Ascend Media Holdings on the sale. Berkery Noyes has been involved with many of the most notable transactions in the healthcare, pharmaceutical tools and services, and medical marketing sectors involving both strategic and financial buyers and sellers. Berkery Noyes provides strategic mergers and acquisitions transaction advisory services, financial consulting and strategic research to middle-market information and technology companies in the United States and internationally. For more information, visit www.berkerynoyes.com.